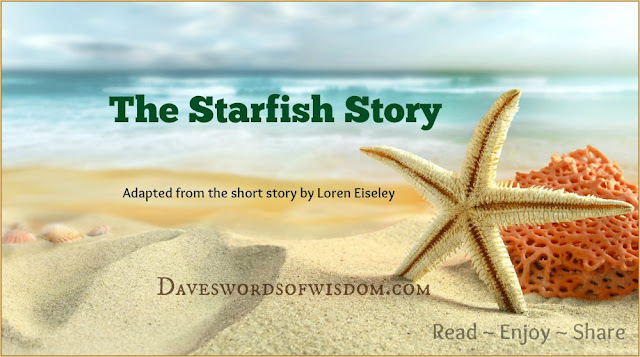 Daveswordsofwisdom.com: The Starfish Story -YOU CAN ALWAYS MAKE A DIFFERENCE! To this, the young man replied, "The sun is up and the tide is going out. If I don’t throw them in, they’ll die." Upon hearing this, the wise man commented, "But, young man, do you not realize that there are miles and miles of beach and there are starfish all along every mile? You can’t possibly make a difference!" At this, the young man bent down, picked up yet another starfish, and threw it into the ocean. As it met the water, he said, "It made a difference for that one!" This story has appeared all over the web in various forms. Sometimes it is a little girl throwing the starfish into the ocean, sometimes a young man. In any form it is a beautiful story and one that makes you think. YOU CAN ALWAYS MAKE A DIFFERENCE!